Hey, do you feel like going out to the island? Celebrating the love between these two island girls! ❀ During CoM's ending, Selphie was the only one of her trio who stopped and went over to Kairi when she was staring out to the sea. ❀ It's implied that Kairi spent that year while she waited for Sora and Riku primarily with Selphie. 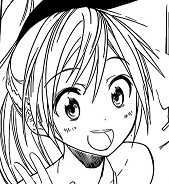 ❀ Selphie trusted Kairi enough to believe her about a boy that she had no memory about. Selphie was clearly confused and hesitant, but she supported Kairi and gave her the benefit of the doubt in a true show of friendship and respect. ❀ Kairi seems to trust Selphie a lot, too, to be willing to talk about a something that was worrying her so much. ❀ They enjoy each other's company. ❀ In the Japanese version Selphie even calls her O-nee-san, wich you use for girls older than you that you’re close to and admire (or for older sisters, of course). ❀ Their upbeat, spunky personalities go well with each other. ❀ Selphie is a total romantic. This one is really long, and it’s more friendshippy than romantic, but Kairi’s and Selphie’s interactions in it are perfect! One of the comparatively better ones I’ve found. SoRiku as a side couple. This one’s okay. 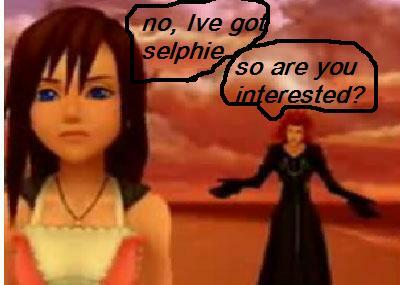 It’s short, Selphie’s PoV, with SoRiku mentioned. This is a pretty cute one! 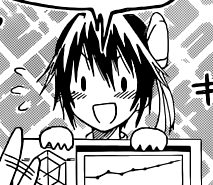 Mentions of Tidus/Selphie/Wakka. It's long for a oneshot, but it’s well-written and it’s characterization is pretty good. SoRiku side pairing. One sided, from Selphie’s point of view. Unrequited SoKai mentioned. A little flowery, but it’s not bad. Very cute bitty!SelKai friendship piece. Not technically a fanfiction, but this short sample shows a cute friendship between Kairi and Selphie. A short Selphie/Kairi friendship piece. A cute, short story of friendship between a young Kairi and Selphie. A well written introspective friendship piece. This story is a collection of oneshots. 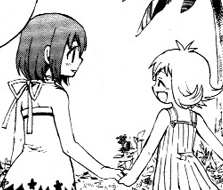 This is the only chapter about Selphie and Kairi. It’s short, but rather nice. 30 short ficlets from Selphie’s point of view about a one-sided love towards Kairi. A nice friendshippy piece about Selphie giving Kairi encouragement for the long journey they’ve got ahead of them. A short piece from Selphie’s point of view. It shows Selphie’s devotion to and belief in Kairi moreso than anything. A short piece about Kairi and Selphie’s friendship. SoRiKai as a main pairing, though. A so-so, angsty short piece hinting at romantic SelKai, but focusing more on the boy they can’t remember. A oneshot AU where Kairi is a princess and Selphie is a chambermaid. Yay, our first member! Welcome aboard, Master Spockanort! Kairi and Selphie are glad to have your support. We've already reached three members~ Hooray~ Welcome aboard, Lonbilly! I must say that this is an imaginative ship. I'm shipping those two now. This is interesting! I can ship them, they'd be adorable together! and it leaves Sora free to date Namine Hmm, maybe I should write a fanfic or something for this pairing.. Can I join? Yes, SelKai is compatible with lots of pairings, and t's lots of fun to think about! Welcome, Lunarmaster54! Shipping the ship that ships itself. Yep! Axel knows it's canon! Hands down my favorite screenshot from Kingdom Hearts. I was so surprised when it happened, but it was built up really well, and the new music they played for it was so heartwarming, I really cried. It was great that this was the first canon pair they made among original characters. So beautiful.